LONDON • Jose Mourinho reportedly cried when he heard David Moyes had been chosen over him as the heir to Alex Ferguson's throne in 2013. He was eventually appointed in 2016 but, having finally landed his dream job, his Manchester United tenure also ended in tears. The axe finally fell on the Portuguese yesterday yet the only surprise among pundits had been how long it took the club to act, coming a day after the third anniversary of his dismissal from a second spell at Chelsea, just six months after winning the Premier League title. The seeds of the inevitable divorce had been sowed as early as pre-season, with Mourinho blaming the board for a lack of backing in the transfer market, before falling out with several first-team players, notably Paul Pogba, Anthony Martial, Luke Shaw and Antonio Valencia. Results on the pitch mirrored the infighting at the club and Sunday's 3-1 defeat by bitter rivals Liverpool, which left United 19 points off the league leaders after just 17 games for their worst start to a season since 1990, proved to be the final straw. Tottenham manager Mauricio Pochettino was instantly installed as the bookmakers' favourite to take over the hot seat, with former Real Madrid boss Zinedine Zidane and former France coach Laurent Blanc also considered to be in the running. The Argentinian, however, sought to quell speculation he could be tempted to leave Wembley for Old Trafford, insisting he was "so focused in trying to deliver my best in this football club". Speaking at his pre-match press conference before Spurs' visit to Arsenal in the League Cup quarter-finals today, Pochettino added he could not address the rumours, but was "so sorry" to hear of Mourinho's sacking. He said: "I have a very good relationship with him so it's very sad news what happened today. It's not my business and I want to send my best wishes to Jose." While an official statement from the club confirmed they would be "appointing a new caretaker manager until the end of the season, as a thorough recruitment process for a new full-time manager is conducted", pundit Gary Neville urged the United hierarchy to pull out all the stops for Pochettino. The former United defender said: "I've been fortunate to spend time at Tottenham's training ground and, for me, he feels like the ideal candidate. "United have tried managers who have won European Cups, they've tried managers who have won multiple leagues. "My view is they need someone who meets the three key principles of the football club, and that is promotion of youth, entertaining football and to win football matches." Rio Ferdinand agreed with his former United teammate, tweeting "the time had come for fresh ideas at United". But, while pundits unanimously agreed the writing had been on the wall for the 55-year-old, some felt others should have joined him in passing through the exit door. Mourinho's departure was in part triggered by the breakdown of his relationship with Pogba, who was not named in United's starting XI at Anfield for a third straight league game. The France midfielder and club-record buy at £89 million (S$154.2 million) courted controversy by taking to Instagram just moments after news of Mourinho's sacking broke, posting a picture of himself smiling and writing "caption this" next to it. His now-deleted post was widely interpreted as celebrating Mourinho's dismissal and he was slammed by Neville, who tweeted: "You do one as well." Former United striker Brian McClair also echoed similar thoughts, tweeting he should "not (be) the only one who should depart". It is understood the compensation due to Mourinho will be no more than £15 million and, according to The Guardian and the BBC, former United striker and current Molde manager Ole Gunnar Solskjaer is the current favourite as interim boss. Wins first trophy at United with a 2-1 victory over Premier League champions Leicester City in the Community Shield at Wembley. United win League Cup after a dramatic 3-2 win over Southampton at Wembley. Guides United to the Europa League title with a 2-0 victory over Ajax in Stockholm. There was an evolution in the other clubs; there was no evolution in this club. In all the areas that make a team successful, I think we stopped in time. That was quite an empty period in the club. JOSE MOURINHO, appraising the spells of predecessors David Moyes and Louis van Gaal in September 2017. If, at the end of the three years, I don't win a single piece of silverware for them, they will say, 'Great guy, good coach, we like him, but we feel nothing special about him'. MOURINHO, saying in October 2016 he must win trophies to be "special" to United fans. We had a bad week. I know that some football Einsteins, they tried to delete 16 years of my career and delete an unbelievable history of Manchester United Football Club and focus on a bad week and three bad results. But that's the new football - it's full of Einsteins. MOURINHO, after successive losses to Manc City, Feyenoord and Watford in 2016. Signs a new contract until 2020, with the option of a further year. Paul Pogba scores twice and Chris Smalling gets the winner as United come from two goals behind to win 3-2 at Manchester City and delay Pep Guardiola's side from securing the Premier League title in the derby. Mourinho's return to Stamford Bridge ends in humiliation as United get thrashed 4-0 by Antonio Conte's Chelsea. United lose 2-1 to Mourinho's former club Real Madrid in the Uefa Super Cup final. A 2-1 quarter-final defeat by Championship side Bristol City ends United's League Cup defence. Sevilla knock United out of the Champions League at the last-16 stage, winning 2-1 at Old Trafford after a 0-0 first leg in Spain. United lose 1-0 to Chelsea in FA Cup final. Defeat at Brighton in the second game of the season is followed by a 3-0 loss at home to Tottenham - the worst home defeat of Mourinho's career. A last-gasp 1-0 win at home to Young Boys saw United qualify for the Champions League knockout stages, but a final matchday loss at Valencia was followed by a 3-1 reverse to Liverpool at Anfield which sealed Mourinho's fate. 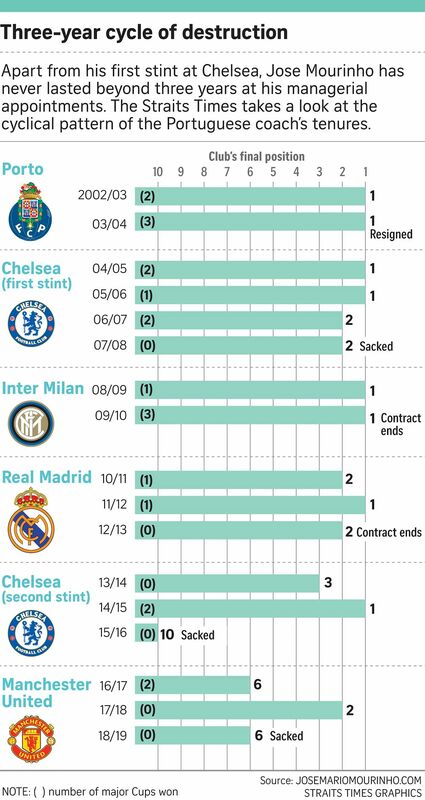 For the first time since leaving Portuguese provincial team Uniao de Leiria for Porto in 2002, Mourinho leaves a club having failed to win a league title.